Michael Phelps' Great 8. 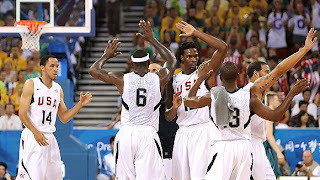 Team USA redeeming the dream. U.S. softball's upsetting finale. Those are a few memorable moments from the Games. Michael Phelps broke Mark Spitz's record by winning eight golds in a single Olympics, and he did it sometimes in dramatic fashion. Jason Lezak helped the 4x100 relay win in the last second, while Phelps later won the 100 fly by one-hundredth of a second. 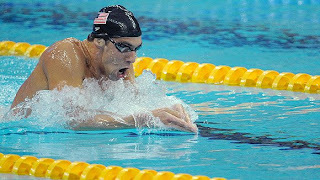 With Michael Phelps swimming into the history books, it was easy to overlook other strong performances by other U.S. swimmers. Case in point: Natalie Coughlin. She won six medals in Beijing, the most by a U.S. woman in one Olympics. The face of the women's soccer team was goalkeeper Hope Solo. She had the back story -- her public blasting of her former coach and goalie at last year's Women's World Cup, goalkeeper Hope Solo helped lead the U.S. women's soccer team to a gold medal in Beijing. She also had the front story -- her shutout of the powerful Brazilians cinched the gold medal. But it was Olympic rookie Carli Lloyd who scored the only goal in a key Olympic match against Japan, and it was Lloyd who scored the goal that won it against Brazil. Nastia Liukin's father just fell short of winning an all-around gold for Russia in the 1970's, but he lived vicariously through his daughter as Nastia edged out U.S. teammate Shawn Johnson to win the all-around. David Neville's headfirst dive to the finish line for bronze in the 400-meter track final was the living symbol of how badly someone can want a medal. Couldn't happen to a nicer guy, and it completed an American sweep of the event -- a rare triumphant moment for the U.S. at the track venue. With the way the U.S. softball team breezed through the Olympics, you would have thought a title was a foregone conclusion. Not for Japan, which upset the Americans in the gold-medal game. 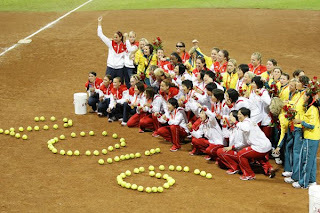 Softball will not return to the Olympics program in 2012. Jessica Mendoza led players from the U.S., Japan, and Australia in an unusual ceremony after Thursday's gold-medal game to send a message to the IOC. They laid softballs in the shape of "2016" on the field. After taking silver in the all-around, floor exercise and the team event, American Shawn Johnson finally got the gold by edging teammate Nastia Liukin in the balance beam. The U.S. women's eight team finally got the best of rowing power Romania, denying the country a fourth straight gold medal with a winning time of 6:05.34. 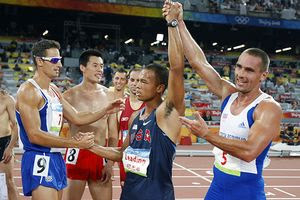 Bryan Clay won the decathlon and was the first American man to win the 10-discipline event at the Olympics since 1996. What was his post-event wish? He jokingly said, "I just want the Wheaties box. Put me on the Wheaties box." John Wooden once won 88 straight basketball games. Sounds impressive until you compare it to the beach volleyball tandem, Misty May-Treanor and Kerri Walsh, which leaves Beijing with a 108-match winning streak. Todd Rogers and Phil Dalhausser completed the American sweep of the beach volleyball gold medals, beating Brazil in three sets. With the thought of his in-laws on his mind (his father-in-law died and mother-in-law was seriously injured after being stabbed in Beijing), coach Hugh McCutcheon and the U.S. men's volleyball team made an improbable run to the gold medal. The U.S. track team was determined to go out on a high note, and that it did. Sanya Richards and Jeremy Wariner anchored both 4x400 relay teams to gold medals after the U.S. fumbled out of the 4x100 relay earlier in the Games. Both U.S. basketball teams won the gold medal in Beijing with Kobe Bryant leading the men to their first Olympic title since 2000 and Lisa Leslie winning her fourth straight gold. My family enjoyed watching many of the Beijing events live on prime-time. Unfortunately, the time difference will make things more difficult for the London Games in 2012. For NBC to show something live in prime-time then, an event would have to be scheduled after midnight — hardly an ideal time for athletes or live spectators. Click here to watch ESPN's Jeremy Schaap reflect on the 2008 Summer Olympics in Beijing. There were definitely some great moments at the recent Olympics! I was happy with how the USA performed. 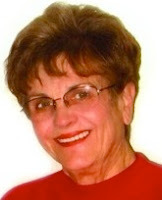 I wanted to extend and invitation to participate in the weekly blog carnival that I host on Athletic Alley! If you follow the backlink, you will see the blog carnival in the right hand column. It could definitely provide more exposure for your site and the sport (or sports) you love. I love baseball and am an Atlanta Braves fan. Unfortunately it doesn't look like they will be playing in October. There is always next year!